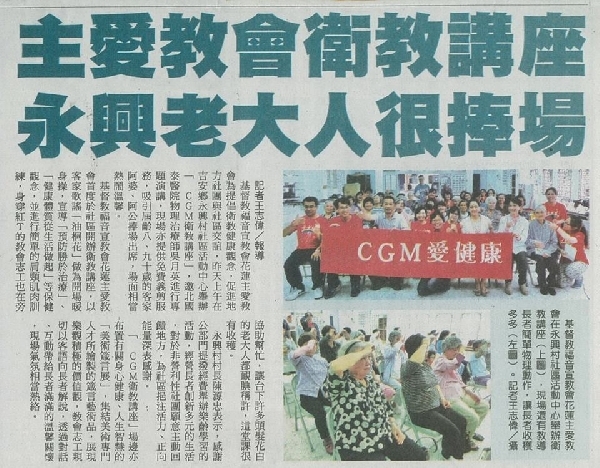 In order to promote healthy perceptions and encourage communion and friendship in local communities, Christian Gospel Mission (CGM) Hualien’s Lord’s Love Church held the “CGM Health Education Seminar” in the community center of Yongxing, Hualien. Physical therapist Yue-ying Wu of GuorTaih United Clinic was invited to give a special lecture at the event; free hairdressing services were also provided. Many Hakka seniors were attracted to the event and the atmosphere was very warm and exciting. It was the first time that Hualien’s Lord’s Love Church held a health education seminar in the community. “Tung Flowers” was sung as the warm-up opening event, after which health-care concepts, such as “Prevention Over Treatment” and “A Healthy Physique Starts WithYour Daily Life,” were promoted. Simple shoulder and neck exercises were also carried out. Church volunteers wearing red T-shirts also helped on the side, gaining the shy praise of many seniors in the audience, who expressed that they gained a lot from the event. The chief of Yongxing Village said that he appreciated the public sectors for allocating funds to hold such an educational event, and for managing and creating an innovative and diverse lifestyle for the seniors. He expressed thanks for the willingness of non-profit organizations to give back to society and for injecting vitality and positive energy into the communities. Set up beside the venue of the “CGM’s Health Education Seminar” was the “Art Proverbs Exhibition,” which discussed physical and mental health and the wisdom of life. The exhibition curated proverb-artworks painted by professional artists, which presented positive and optimistic values. Church volunteers explained to the seniors patiently in the Hakka dialect and treated the seniors with warmth and care through conversation and interaction; the scene of the event was very warm and intimate.